May Racing - Blew Bird started the season on a winning note at the St. Michael's Dinghy Club Wednesday Night PHRF Series. The Twilight Series got underway with Chikanery winning a see-saw battle with Mysterious Ways. Thunderation placed third. Mysterious Ways turned the tables on Chikanery in the second Twilight Race with Thunderation third again. In Race 3 of the series, Chikanery held off Thunderation while Mysterious Ways placed third. Twilight Races 4 & 5 produced the same results: Chikanery, Thunderation, Mysterious Ways. 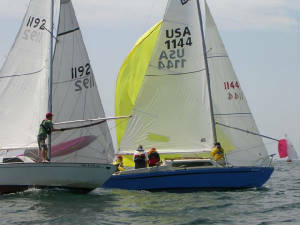 The Lipton Cup was highlighted by close finishes in each of the four races. Mysterious Ways won Races 1 & 3 while Chikanery prevailed in Races 2 & 4. Thunderation was third in each race. Twilight Race 6 was won by Mysterious Ways followed by Chikanery and Thunderation. QBRW - Three races produced three different winners. Thunderation prevailed in Race 1 with Chikanery second and Mysterious Ways third followed by Amr'a. Mysterious Ways won Race 2 followed by Chikanery & Thunderation. The winner of Sunday's race would break the three-way tie and clinch the series. Chikanery got the gun followed by Thunderation & Mysterious Ways. Chikanery won the five-race Spirit Series with Amr'a second and Mysterious Ways third. At the T-Bird Internationals in Toronto, Blew Bird was the top Fleet 5 finisher placing fifth. Chikanery placed eighth and Mysterious Ways 12th. Atomic Salsa was back on the Race Course for the Twilight Series and placed third behind Chikanery & Mysterious Ways. Thunderation was fourth. The next Twilight Race was canceled after the wind died at the top of the first beat. Chikanery won the final two races of the series with Mysterious Ways 2/3 and Thunderation 3/2. Following two days of postponements, the Hanson & MacCormack races were combined into one race. Amr'a prevailed over Joe Keaney's T-Bird. 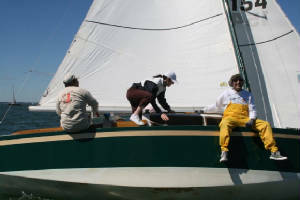 Four T-Birds participated in the 11-mile GCR pursuit race and all four finished in the top half of the 105-boat fleet. Chikanery was 28th, Mysterious Ways 31st, Amr'a 38th and Atomic Salsa 41st. Four T-Birds entered the BHIR 12-mile pursuit race. Chikanery & Mysterious Ways finished 2-3 in Spinnaker Class C while Thunderation skipper Don Kavanagh was second in the Master's Division for first skipper over age 65 to finish. Jon Lee's Draco placed third in Cruising Class F.